In Colorado, the beautiful outdoors set our state apart from all the others. But our forests are in trouble because lurking below the tree lines are silent killers, sucking the life out of trees. DENVER -- In Colorado, the beautiful outdoors set our state apart from all the others. But our forests are in trouble because lurking below the tree lines are silent killers, sucking the life out of trees. Mike Lester, with the Colorado State Forest Service knows this more than anyone. “These are some of the worst outbreaks we’ve had in Colorado in memory,” said Lester. Currently, it’s the spruce beetle hitting the trees the worst. 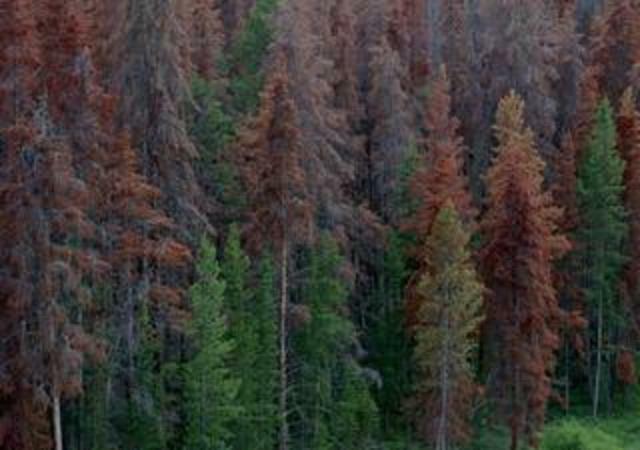 The spruce beetle is responsible for the death of more spruce trees in North America than any other natural agent. Lester and his team just finished studying the health of our forests and mapping out how much bark beetles have gotten to. He told Denver7 more than 5 million acres have been damaged. “If you look at these beetles, most of them are native. And what kept them in check historically, is really cold weather,” said Lester. Warming temperatures keep more bark beetles alive, he said. They burrow inside the trunks, blocking water from the tree, ultimately killing it. The problem multiplies because more dead brush leads to more wildfire fuel. “…When they do burn, they’re really hard to manage and hard to predict their fire behavior,” said Lester. Wildfires, in turn, bring other dangers, as they can move the soil, affecting our resources. “If you’re a water utility, you’re gonna be filling your reservoir with silt instead of water, so we need to look at the areas that are more susceptible and focus our efforts there,” said Lester. So how do we manage them? Lester told Denver7 it starts with this study , then spreading the word. They also help private landowners take care of their own trees, too, because the forest service can’t do it all alone. “When all the foresters are fully staffed, both the state and federal agencies... we don’t have enough people to get the work done,” said Lester. They do treat the hardest hit areas though, thinning out or removing the dead and infested trees or using pheromone patches to drive off the beetles. But there’s more to do, Lester said. And our actions could determine how much of the forest future generations can enjoy.